On December 14, 2016, the Office of the Prime Minister and Council of Ministers made public property details of Prime Minister Pushpa Kamal Dahal and 30 other cabinet ministers. Among the ministers from the CPN (Maoist Center), we compared how much cash and property have party chairman and prime minister Pushpa Kamal Dahal, deputy prime minister and finance minister Krishna Bahadur Mahara and energy minister Janardan Sharma accumulated since they last disclosed their property details along with 35 central committee members of the then CPN (Maoist) in 2005. 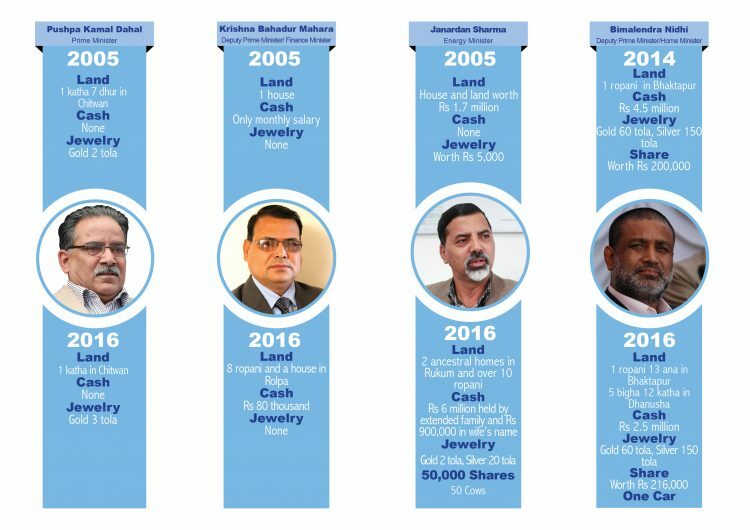 Among Nepali Congress ministers, we compared deputy prime minister and home minister Bimalendra Nidhi’s property details with the figures released in 2014 when he was a minister in the Sushil Koirala-led government. Prime Minister Pushpa Kamal Dahal’s property seems to have decreased only slightly from 1 kattha 7 dhur (around 4920 sq ft) to 1 kattha (3,645 sq ft). Similarly, the highest gains were made by Janardan Sharma who in his property details in 2005 had mentioned that he had no cash. As per last week’s details there is Rs 6 million in cash held by his extended family and another Rs 900,000 in his wife’s name. Home Minister Bimalendra Nidhi who is among the richest ministers in the current cabinet with 60 tola [700 grams] of gold, 150 tola [1.75 kg] of silver and property in Bhaktapur and Dhanusha, saw his cash holding decreased by almost two million rupees from Rs 4.5 million in 2014 to Rs 2.5 million in 2016.